Acknowledged as the scion of the Gwalior musical gharana, Meeta Pandit has emerged as a shining star in the world of classical music. Meeta is grand-daughter and disciple of Padma Bhushan Pt Krishna Rao Shankar Pandit, the doyen of Northern Indian Classical music in the 20th century, and the daughter and disciple of legendary Pt L K Pandit. Meeta is the sixth of the unbroken Pandit line and has the unique distinction of being the first woman musician in the family. Her melodious and robust voice coupled with intricate handling of ragas has won her critical acclaim, and a following of music lovers. Meeta's voice is unique-deep, rich and penetrating with tremendous power, stretching over an amazingly wide range of over 3 octaves. The rendering of traditional, but increasingly rare, Tappa is one of the sublime offerings in her concerts. Besides the styles of Khayal and Tappa, Meeta is equally adept with genres of Tarana, Bhajan, Thumri, Sufi, as well as cross cultural music. 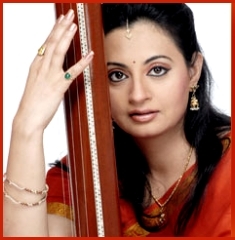 She has performed extensively in prestigious festivals in India and abroad, at concerts in France, Germany, London, Switzerland, Norway, Rome, USA, Russia, and Bangladesh. Meeta was presented as the cultural ambassadress for the SAARC Music Festival in Islamabad in 2004. She was also invited in 2003 by Government of France as Artist in Residence to be based in Paris.A film on her titled 'Meeta - Linking a Tradition with Today' has been made by the Public Service Broadcasting Trust along with Prasar Bharti in 2005. She is an A-Grade artist of All India Radio.Her unique method of teaching music for Indian and western students has made her a much sought after guru (teacher). Meeta conducts workshops twice a year in France, besides training many students under the guru-shishya parampara in India. A PhD in Music, Dr Meeta Pandit has won many National awards like 'The Golden Voice of India', 'Sur-Mani', 'Yuva Ojaswini' and the 'Yuva Ratna' alongwith the 'Young Achiever of the Year' for the field of Hindustani music by FICCI, a leading corporate forum in India. Leading magazines of India such as 'India Today' and 'The Week' have featured her as one of the 'Youth Powers' - leading India in the Millennium.In 2008, she was awarded the highly prestigious 'Ustad Bismillah Khan Yuva Puraskar' of the Sangeet Natak Akademi, given to promising artistes under 35. Music Today has released her albums titled 'Footsteps', 'Young Maestros', and 'Tansen'.In an effort to increase awareness of Indian classical music in India, Meeta hosts a 'Swar Shringaar' a radio programme on World Space Radio - 'Radio Gandharva'.